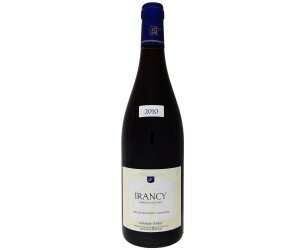 An Irancy with the typical dress very assertive, thanks to the contribution of 4% of Caesar in addition to Pinot Noir. On the nose, the strength of the aromas of cherries is immediate, ripe almost candied as if they were mixed with sugar in a pan. It is then that other notes of red fruits appear in all discretion to evoke raspberry, currant and wild strawberry. With a few years of patience, these notes evolve towards the sweet roundness of cherry jam and red fruits with brandy. In the mouth, we enter a delicate world of wealth, finesse and elegance, again, the wood is never dominant or even easy to detect as it is integrated into the wine. He supports it, values ​​it but does not hide it. At the end of the mouth, there are even notes of cherries and almonds that drag on the palate. The domaine Verret produces the great wines of Auxerre, St Bris, Irancy and Chablis. It's been 250 years since the family began cultivating the vines. Today the Verret family exploits 57 hectares of vines, produces 20 references a year and employs 16 people throughout the year and is still more recognized in its charts, contests and guides. Bruno Verret cultivates a clever blend of experience, innovation and ambition that aims to be solely for the purpose of the quality of his wines. This is a red wine made from Pinot Noir grapes. An unusual feature is that it may, if desired, include in its composition up to 10% of César, a traditional grape of this region. Rich in tannins, lively in colour, the César is a noble grape which lends the wine an interesting personality. Minor differences are observable according to whether a given cuvée is made with Pinot Noir only or includes an element of César. The strong crimson colour of this wine, shading towards dark red, is rich in highlights. The bouquet is bursting with fruit aromas (blackcurrant, Morello cherry, raspberry, blackberry) with sometimes floral, liquorices or pepper notes. On the palate, the tannins melt into a firm and velvety structure. Its acidity is sufficient to ensure excellent keeping qualities (3-10 years). Red: solid yet charming, Irancy cries out for dishes with strong, meaty flavors. Spare ribs and other barbecued meats will find it an enthusiastic partner because it combines virile tannins with real aromatic power. Casseroles, of poultry for example, are another worthy match. And it goes without saying that cold cuts and pâtés, faggots and terrines find in Irancy a boon companion, its tannins balance the unctuousness of dishes like these. Serving temperature: 15 to 18 °C. Irancy, in the Grand Auxerrois region, stands on the right bank of the Yonne river, some fifteen kilometres South of Auxerre and South-West of Chablis. It is typical of the wine-growing villages of the district. It boasts a majestic church, as well as the house where G. Soufflot, architect of the Paris Panthéon, was born. The handsome winemaker’s houses make a fitting setting for a red wine with such a long-established reputation. It was raised to the status of an appellation Village, which it shares with the neighboring villages of Cravant and Vincelottes, in 1999. The hill-slopes hereabouts form a bowl surrounding the beginnings of a plateau below which runs the river Yonne. The slopes are for the most part composed of Kimmeridgian marls with an admixture of brown limestone soils and here the Pinot Noir grape flourishes at altitudes of 130-250 metres. Exposures vary, mostly southerly or South-westerly. Some terroirs have long been recognized as being of unusual merit.